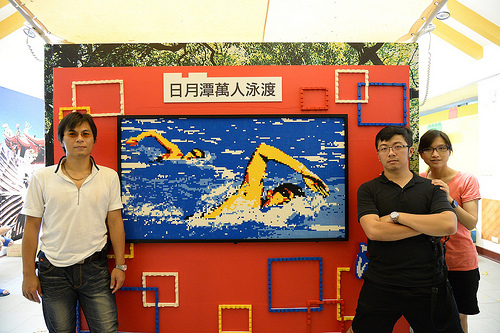 Next up is a fabulous mosaic by a pair of Taiwanese builders Swar(left) and 娘娘槍(middle) called Swimming Carnival of Sun Moon Lake. The photo comes courtesy of lixia_1982 who has more photos from the recent Train Festival exhibition in Nantou. Don’t even think about going all Elvis on this model, you unruly hooligans, these guys (and gal) don’t look like they would brook your shenanigans. This post was ripped off from the good folks over at Mosaic Bricks.